Located on the corner of Bowen Bridge Rd and Gregory Terrace Bowen Hills, it is a rare example of Byzantine-Victorian architecture. 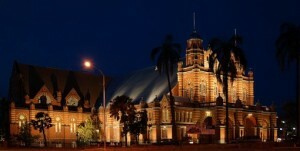 Constructed in 1891 as an exhibition and concert hall for the RNA, it was one of Brisbane’s premiere venue for balls, concerts and civic functions. It also one of the earliest venues that the people of Brisbane experienced motion pictures. It later, until the 1980’s, housed the Queensland Museum and Queensland Art Gallery. It is presently the home to a number of arts organisations. Entry – via Gregory Tce gate. Turn right for parking and entry to screening room. Parking – Available most evenings on-site. Check the film listing on this site closer to the date for parking detail. We are generally guaranteed parking outside the entrance to our screening room for assistance for our elderly/persons with mobility issues. If this area is full proceed along the driveway (as if turning right when entering the grounds) as ample parking is available along this driveway and at the rear of the building. Ample metred parking is available on Gregory Tce and surrounding streets. Please call Michael Brooks on 0418 186 686 if you have any questions regarding parking for Cine-Retro events only. Events in the RNA showgrounds do not affect access to, or use of, the Old Museum building. Entry to Gregory Tce is closed at the Brookes St end during the RNA show and certain other events. Access to Gregory Tce at these times is from the Bowen Bridge Rd end or via Miserton St off St Pauls Tce then Anderson St.